Researchers have long debated whether magnesium plays a role in regulating blood pressure with inconsistent and controversial evidence from studies in humans. This meta-analysis, however, collected data from 34 clinical trials, involving 2,028 participants, and found a small but significant association between magnesium intake and reduced blood pressure. With epic levels of obesity and CVD, it’s only a matter of time before we start looking at nutritional supplementation as an accessible, affordable and effective path to health and wellness. Steve just uploaded his latest podcast on how to build strong healthy bones for a lifetime. Thanks Steve. I have worked with a lot of women regarding their bone health. It is one of the major concerns for women as they age. I know from personal experience as my wife went from osteopenia to osteoporosis by her mid 50s. This occurred even though she was on a quality bone support formula. She had the same result as thousands of other women who we desperate to stop the bone loss. Something was wrong. The nutrients were all the reported required nutrients such as calcium, magnesium, zinc, copper, vitamins D, B6 etc. These were the better of the formulas available in the early 2000s. My wife was looking for a solution that did not involve the drugs. It was at this time that we learned something new about osteoporosis. We learned that strontium is used as a treatment for osteoporosis in some parts of the world. We learned of another nutrient called ipriflavone which has a similar benefit, and we were all learning about the importance of higher dose vitamin D3. So these were added to her supplement program. Her doctor was skeptical and wanted her to take a bisphosphonate bone building drug. No, thank you. As a result, her bone density was increased by nearly 4 percent in 4 years. Wow. She was then 60 years old and building bone. Around 2010 we began to learn more about bone support nutrients.We discovered BioSil (orthosilisic acid) a specific form of collagen building silica. And we learned about vitamin K2. And so these were added to her program. The result after 2 more years was another 3 percent improvement in bone density. She is up 7 % in 7 years. She is soon due for her next bone density scan. Will this trend continue? It’s been an exciting result so far, and we anticipate continued benefit. This is an expensive program to follow if you take everything my wife takes. So here is my list in declining order of importance. I have no basis for this other than personal experience of my wife and other women I have advised. You need to determine the program that you are comfortable with and can afford. A high quality natural bone support formula – if you aren’t sure visit a knowledgeable health food store. There are now bone building formulas that include higher amounts of vitamin D3 and added K2. Some even include strontium as a separate formula. These may be the more cost effective but somewhat limited way to go. Look for quality brands and then compare formulas and price. Vitamin D3 – Get tested and the adjust to the optimum dose for you. Vitamin K2 – 80 to 100 mcg. per day. BioSil – follow label directions. Strontium – 680 mg. per day, taken apart from calcium. ipriflavone – follow label directions. In this podcast, I will give you my best advice for women who are concerned about osteoporosis. You can also print out a copy of my paper entitled “A Natural Approach to Bone Health”. You will find in depth interview on vitamin D3, K2 and BioSil at HealthQuestPodcast.com. Search the TAG INDEX to easily find all related content. Of the many risk factors associated with heart health and cardiovascular disease (CVD), the primary targets of natural products are cholesterol, triglycerides, blood pressure, blood flow, endothelial function, atherosclerotic plaque formation and heart rate/rhythm. The broader view considers the effects of natural ingredients on various cardiac events, in preventing and limiting damage, as well as aiding recovery. Natural Products Insider featured an article that showcases over seventy studies using, antioxidants, omega fatty acids, CoQ10 and numerous other nutritional supplements to impact cholesterol and heart disease. It’s a good start next time your doctor tells you there isn’t enough research on foods and nutritional supplements. New Research Challenges the ‘Body Knows What It Needs’ Theory and Where Men Differ From Women. A cupcake is calling you. You can practically taste the sweet, creamy goodness. You want it so badly you can’t think of anything else. But is it really the taste you crave—or the pleasant associations it brings? Or do you crave it partly because you know you shouldn’t have it? Will fighting the urge make it go away or only make it worse? Why do people crave certain foods at certain times? There’s a surge of research in this field as scientists try to understand the complex relationships among food, mood, and behavior. Scientists are exploring all these questions as they seek to understand food cravings. The research is taking on new urgency with the nation’s obesity epidemic, since cravings are widely believed to influence snacking behavior, binge eating and bulimia. Food cravings activate the same reward circuits in the brain as cravings for drugs or alcohol, according to functional MRI scans, tests that measure brain activity by detecting changes in blood flow. Nearly everyone has food cravings occasionally, but women report having them more often than men, and younger people crave sweets more than older people do. In one study, 85% of men said they found giving in to food craving satisfying; of women, only 57% said they did. While many women report craving salt, fat or bizarre combinations of food during pregnancy, researchers can’t find much scientific validation. They suspect folklore and the power of suggestion instead. For decades, researchers surmised that food cravings were the body’s subconscious effort to correct nutritional deficiencies. Longing for steak could indicate a need for protein or iron, according to this theory. Chocoholics might be low on magnesium or other mood-altering chemicals that chocolate contains, including phenylethylamine, a compound humans produce when they’re in love. But a growing body of research casts doubt on the nutritional-deficiency notion. After all, few people crave vitamin-rich green leafy vegetables and many other foods contain more phenylalanine than chocolate—including salami and cheddar cheese. Instead, studies show that food cravings involve a complex mix of social, cultural and psychological factors, heavily influenced by environmental cues. While chocolate is consistently the most-craved food in North America, Japanese women are more likely to crave sushi, a recent study found. And only 1% of young Egyptian men and 6% of young Egyptian women reported craving chocolate, according to a 2003 survey. “Many other languages don’t have a word for ‘craving.’ The concept seems to be uniquely important in American culture,” says psychologist Julia Hormes at the University at Albany. In the U.S., about 50% of women who crave chocolate say their cravings peak around the onset of their monthly period. But researchers haven’t found any correlation between food cravings and hormone levels, and postmenopausal women don’t report a big drop in chocolate cravings, a 2009 survey found. Some psychologists suspect that women may be “self-medicating,” because sweets and carbohydrates spur release of serotonin and other feel-good brain chemicals. Typically, people crave foods they enjoy—but not always. “It’s possible to like a food without craving it, and crave a food without liking it,” says Marcia Pelchat, a food psychologist at the Monell Chemical Senses Center, a research facility in Philadelphia. Too many sweets can flood the brain’s reward circuits, causing constant cravings. Functional MRI scans by Dr. Pelchat showed that sensory memory food cravings activate the same parts of the brain that drug and alcohol cravings do, including the hippocampus, which helps store memories; the insula, involved in perception and emotion; and the caudate, which is important for learning and memory. The circuit is driven by dopamine, the neurotransmitter responsible for reward-driven learning. Experts say that cravings are fine on occasion—say, for pumpkin pie at Thanksgiving, gingerbread at Christmas or for healthy choices year-round. But indulging too often can send cravings spiraling out of control. Brain researchers have documented that when people continually bombard their reward circuits with drugs, alcohol or high-fat, high-sugar foods, many of the dopamine receptors in the system shut down to prevent overload. And with fewer dopamine receptors at work, the system craves more and more, insatiably. 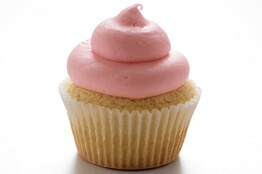 “Pretty soon, one cupcake doesn’t do it anymore. You have to overstuff yourself and you still don’t get that reward,” says Pam Peeke, a physician and author of the new book, “The Hunger Fix.” She notes that food addiction creates changes in the prefrontal cortex, which normally override impulsivity and addictive urges. 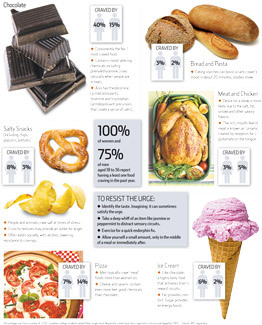 What is the best way to fight food cravings? Many studies have shown that the more subjects try to restrict a food, the more they may crave it. So some experts suggest embracing and controlling the urge instead. One 2003 study at University College in London found that subjects who ate chocolate only in the middle of a meal or just after were more successful at giving it up than those who ate it on an empty stomach. Cognitive behavior therapy can also be helpful. Researchers in Adelaide, Australia, gave 110 self-professed chocolate cravers each a bag of chocolates to carry around for a week, and instructed half of them in “cognitive restructuring”—challenging their thoughts about chocolate—while the other half learned “cognitive defusion”—accepting and observing their thoughts without acting on them. At the end, the defusion group had three times as much chocolate left than the other group. Exercise can also cut food cravings. Women who walked briskly on a treadmill for 45 minutes had far less brain response to food images, according to a new study from Brigham Young University in Provo, Utah, published in the journal Medicine & Science in Sports & Exercise. Other forms of distraction include chewing gum and smelling a nonfood item. Taking a deep whiff of jasmine, for example, helps occupy the same aroma receptors that are a key part of food cravings. Dr. Peeke suggests setting a timer for 30 minutes whenever a craving comes on. Busy yourself with something else until the timer goes off. The craving may have passed. “If you can at least delay eating the craved food, you can weaken the habitual response,” agrees Dr. Pelchat. The good news: The longer people stave off their food cravings, studies show, the weaker the urges become. The Answer: Choose tomatoes in glass bottles (which do not need resin linings), such as the brands Bionaturae and Coluccio. You can also get several types in Tetra Pak boxes, like Trader Joeâ€™s and Pomi. Do watch the video below. It is quite helpful. However, I’ll tel you now, there are no tomatoes in BPA-free cans, and you’ll have to search for those in glass. I found organic tomato sauce and canned sun-dried toms at my organic grocers. A brief google search was very unsatisfactory — with one food site trying to convince me that BPA in tomato cans wasn’t that big a deal!!! We haven’t been lucky enough to have a big crop of summer tomatoes to can. But boy, we sure can grow tiny tomatoes, peppers, potatoes, and Japanese egg plant! Odd about the tomatoes, isn’t it? Which cans are BPA Free? Watch the Video. The Situation: Cattle evolved to eat grass, not grains. But farmers today feed their animals corn and soybeans, which fatten up the animals faster for slaughter. More money for cattle farmers (and lower prices at the grocery store) means a lot less nutrition for us. A recent comprehensive study conducted by the USDA and researchers from Clemson University found that compared with corn-fed beef, grass-fed beef is higher in beta-carotene, vitamin E, omega-3s, conjugated linoleic acid (CLA), calcium, magnesium, and potassium; lower in inflammatory omega-6s; and lower in saturated fats that have been linked to heart disease. â€œWe need to respect the fact that cows are herbivores, and that does not mean feeding them corn and chicken manure,â€ says Salatin. The Answer: Buy grass-fed beef, which can be found at specialty grocers, farmersâ€™ markets, and nationally at Whole Foods. Itâ€™s usually labeled because it demands a premium, but if you donâ€™t see it, ask your butcher. The Situation: Chemicals, including perfluorooctanoic acid (PFOA), in the lining of the bag, are part of a class of compounds that may be linked to infertility in humans, according to a recent study from UCLA. In animal testing, the chemicals cause liver, testicular, and pancreatic cancer. Studies show that microwaving causes the chemicals to vaporizeâ€”and migrate into your popcorn. â€œThey stay in your body for years and accumulate there,â€ says Naidenko, which is why researchers worry that levels in humans could approach the amounts causing cancers in laboratory animals. DuPont and other manufacturers have promised to phase out PFOA by 2015 under a voluntary EPA plan, but millions of bags of popcorn will be sold between now and then. The FDA says it’s safe. How about you? Watch the Video. The Answer: Buy organic potatoes. Washing isnâ€™t good enough if youâ€™re trying to remove chemicals that have been absorbed into the flesh. The Situation: Nature didnâ€™t intend for salmon to be crammed into pens and fed soy, poultry litter, and hydrolyzed chicken feathers. As a result, farmed salmon is lower in vitamin D and higher in contaminants, including carcinogens, PCBs, brominated flame retardants, and pesticides such as dioxin and DDT. According to Carpenter, the most contaminated fish come from Northern Europe, which can be found on American menus. â€œYou can only safely eat one of these salmon dinners every 5 months without increasing your risk of cancer,â€ says Carpenter, whose 2004 fish contamination study got broad media attention. â€œItâ€™s that bad.â€ Preliminary science has also linked DDT to diabetes and obesity, but some nutritionists believe the benefits of omega-3s outweigh the risks. There is also concern about the high level of antibiotics and pesticides used to treat these fish. When you eat farmed salmon, you get dosed with the same drugs and chemicals. The Answer: Switch to wild-caught Alaska salmon. If the package says fresh Atlantic, itâ€™s farmed. There are no commercial fisheries left for wild Atlantic salmon. Other costs and impacts of farmed salmon in the video. The Answer: Check labels for rBGH-free, rBST-free, produced without artificial hormones, or organic milk. These phrases indicate rBGH-free products. For a little back story on the story you didn’t get, watch the video. The Situation: If fall fruits held a â€œmost doused in pesticides contest,â€ apples would win. Why? They are individually grafted (descended from a single tree) so that each variety maintains its distinctive flavor. As such, apples donâ€™t develop resistance to pests and are sprayed frequently. The industry maintains that these residues are not harmful. But Kastel counters that itâ€™s just common sense to minimize exposure by avoiding the most doused produce, like apples. â€œFarm workers have higher rates of many cancers,â€ he says. And increasing numbers of studies are starting to link a higher body burden of pesticides (from all sources) with Parkinsonâ€™s disease. The Answer: Buy organic apples. If you canâ€™t afford organic, be sure to wash and peel them first.